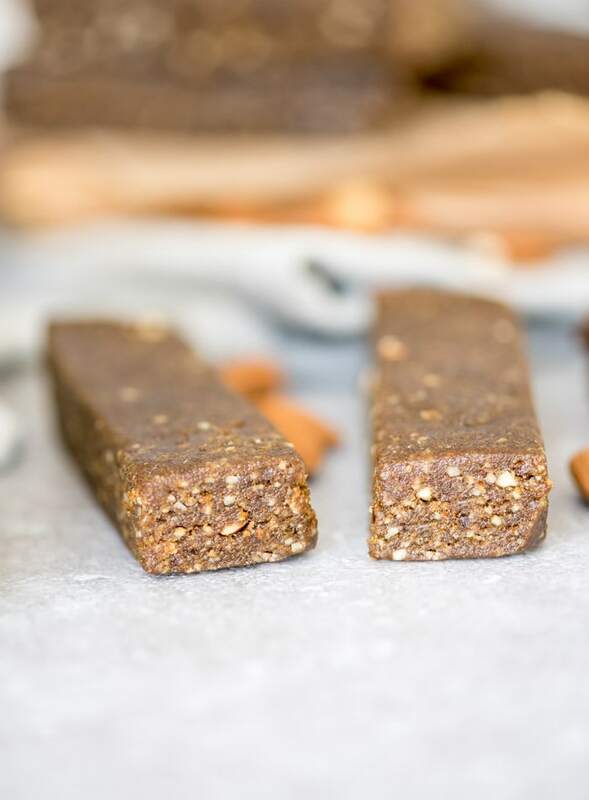 Vegan Hemp Protein Bars | no-bake and only 6 Ingredients! 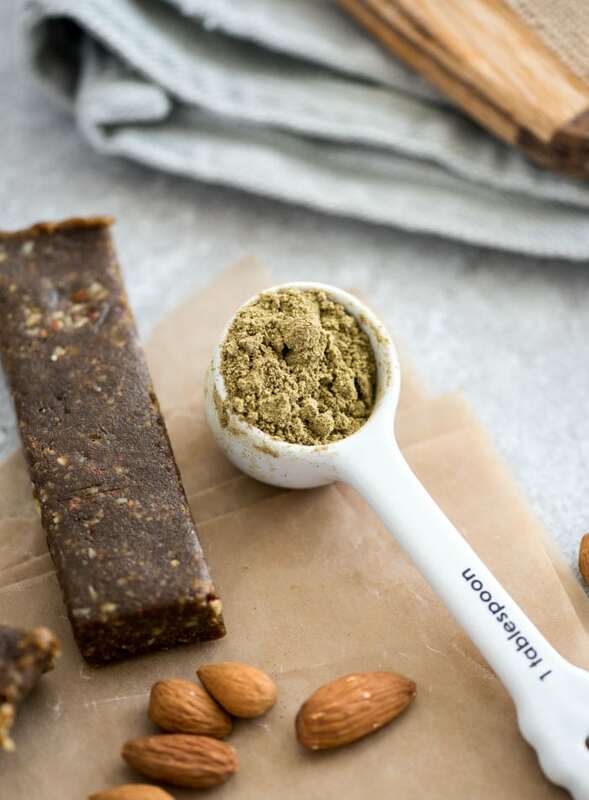 You’ll need just 6 simple, healthy ingredients and about 5 minutes to make these vegan hemp protein bars. Once you’ve blended the dough, pop them in the fridge and shortly thereafter, presto! 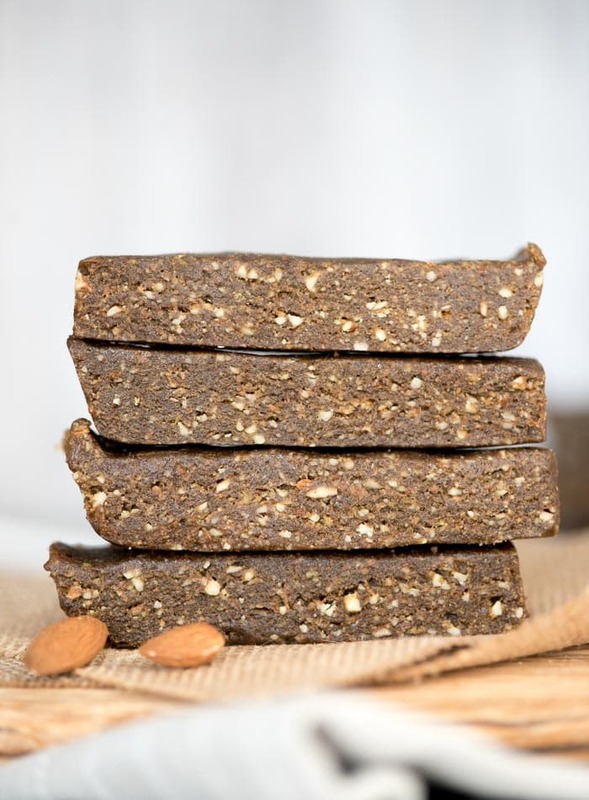 Delicious and nourishing, No-Bake Vegan Hemp Protein Bars! These bars are all-natural, gluten-free, oil-free, easy to make and with a spicy kick of cinnamon, creamy almond butter and naturally sweet dates and pure maple syrup, they taste amazing too. Did you know that hemp is one of the best foods you can eat for a balance of omega 3, 6, and 9? Not only is hemp high in omega-3 but it’s also very high in minerals in particular magnesium, which is key for metabolizing those omega-3‘s. Hemp also contains manganese which is good for ligament and tendon pain, zinc which is important for prostrate health and testosterone production and iron which plays a roll in oxygen-carrying red blood cell production. All of these factors make hemp an excellent anti-inflammatory food. and more…if there was one food that truly deserves to be called a superfood, hemp just might be it! 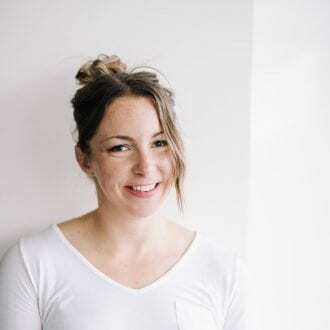 I’d recommend adding hemp to your diet whether you’re a vegetarian, vegan or otherwise, it’s a serious nutritional powerhouse and it’s very easy to incorporate into recipes. These delicious bars are a place to start! 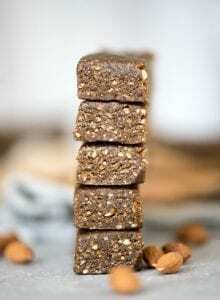 These hemp protein bars are a cinch to make. It’s just quick mix in a food processor or a high-speed blender and you’re done. Once you have that nice, thick, yummy dough, press it into a pan and let it set in the fridge or freezer until firm. 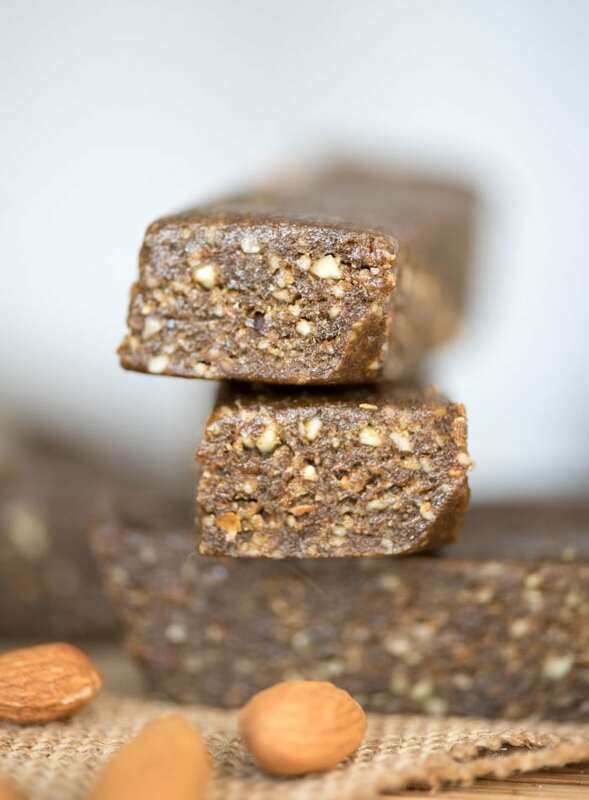 You only need 6 everyday, wholesome ingredients to make them, they’re naturally sweetened with dates and pure maple syrup, have have a whole tablespoon of cinnamon for a spicy kick and blood-sugar stabilizing benefits and they make a fantastic pre-workout energy booster or healthy snack anytime you need it. I used almond butter in these bars but you can also use tahini, sunflower seed butter, cashew butter or peanut butter. I’m definitely making them with tahini next time! I also used plain hemp protein but you could also use a naturally-sweetened vanilla or chocolate flavour if that’s what you have. 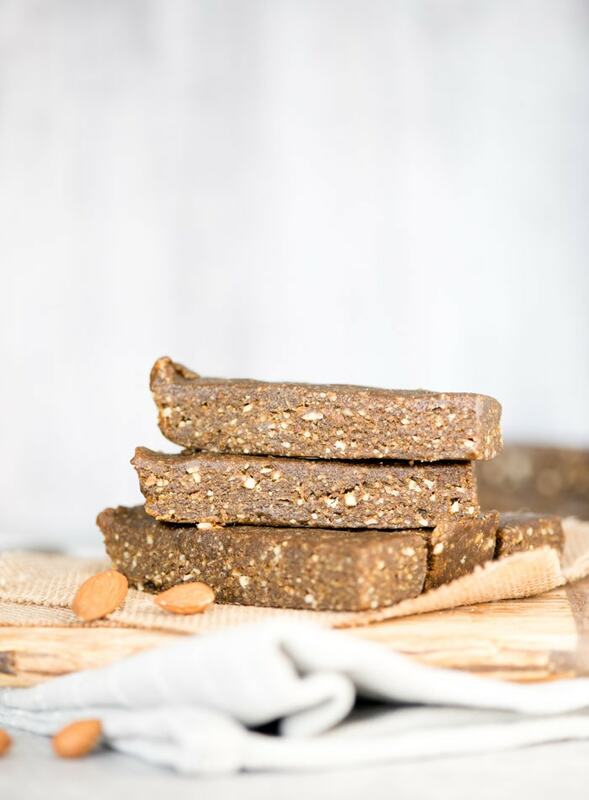 You only need a couple of minutes to whip up these healthy, no-bake bars made with hemp protein. They’re all-natural, nutrient-packed and totally delicious! First place the nuts in a processor and mix until broken down. It’s okay if there are still some large pieces. Add in the dates and continue to mix, stopping to press down as needed. Add in the rest of the ingredients and process until it forms a thick dough. Remove and press into a small square baking pan lined with wax or parchment paper. Place in the freezer for 60 minutes or the fridge for a few hours. Remove and cut into 14 bars. Store in the fridge in an air-tight container for up to 1 week or the freezer for up to 3 months. Those look delicious! Thanks for sharing all the other recipes too! I would like to make this recipe without using dates. Are the dates just for taste or necessary for texture? Thank you for your time. Unfortunately, the dates in this recipe are required to bind it all together. You could maybe try the recipe with raisins, soaking them first in hot water for 10 minutes then draining before using. I haven’t tried it though so I can’t guarantee they’ll turn out. PS. How many bars should this make? If you use a loaf pan you can either cut it into 8 larger bars or 16 small bites. It’s up to you! I cut them larger at first but then decided I wanted more pieces so I made them smaller. Those look amazing! I don’t have the hemp protein but I DO have hemp hearts. Could I still use this recipe, just with the shelled seeds? These are delicious! I made them a couple weeks ago and enjoy them as a mid morning snack with coffee-YUM! I love these bars, they are delicious, but I just cannot get the consistency right! Maybe I’m not adding enough dates? Every time I try they fall apart! Any advice would be greatly appreciated. Are your dates soft? Maybe they’re too dry? You can try soaking them in hot water for 15 minutes and then draining before using. Mine have always stuck together so I’m not sure what else it would be except maybe your almond butter being too dry as well?